If you subscribe to home delivery of the Jessamine Journal newspaper, please click here to activate your free online access to the articles, videos, photo galleries and more. With this digital membership, you get unlimited access to websites of The Advocate Messenger, The Winchester Sun, The Jessamine Journal, and The Interior Journal. You also get access to the e-editions of the four papers as well. With this digital membership, you not only get unlimited access to The Jessamine Journal website but to the e-edition as well. The Jessamine Journal VIP Membership gives you complete access to the website, the e-edition, and home delivery of the printed newspaper for a year. at Centre College in Danville. record holders — and a three-time U.S. national-champion pole vaulter? Surprisingly, the answer is Danville’s Centre College for Maximum Velocity. From Wednesday, June 11, to Friday, June 13, West Jessamine High School’s Conner Chess, Susanna McDaniel and assistant coach Caleb McDaniel joined East Jessamine’s Austin Yates, Jade Jenkins, Stephanie Snyders and assistant Cindy Reilly, in addition to West’s assistant baseball coach Steven Shearer’s sons, Cade and Cooper at the event. 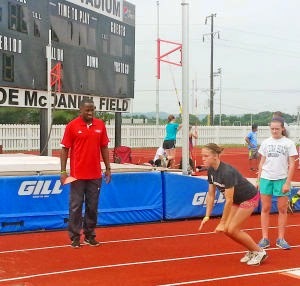 A total of nine world-class athletes headed up the clinics for the camp held at Centre, which concluded Saturday with the Bluegrass State Games. Maximum Velocity, was a dream come true for Centre College track and field and cross-country head coach Lisa Owens. It all started when Owens met her long-time idol Jackie Joyner-Kersee five years ago. At that time, Owens pitched Joyner-Kersee the idea of doing an overnight camp at the college. Considered by many to be one of the best female athletes to ever live, Joyner-Kersee was instrumental in helping develop the camp in its first two years. Joined by Sharrieffa Barksdale, a 1984 Olympian in the 400-meter hurdles, the athletes drew interest from what looks like a who’s who in the track and field record books. An impressive list of athletes have shown up over last four years to coach the camp athletes ranging from ages 12-19. The camp introduction was made on Wednesday afternoon by Owens. She went on to introduce the first four clinicians, which included Jamie Nieto, a two-time Olympic high jumper; 2012 gold medalist Aries Merritt (men’s 110-meter hurdles and current world record holder); bobsled and sprinting gold- and silver-medalist Lauryn Williams; and three-time pole-vaulting national champion Mark Hollis. Remaining Olympians arrived Thursday with the welcoming of two-time Olympian and long-jump gold-medal winner Dwight Phillips; Hazel Clark-Riley, a middle distance-runner and three-time Olympian with seven U.S. titles in the 800-meter women’s run; Olympic discus gold-medalist Stefanie Brown-Trafton; and Kevin Young, who is the only man to ever run a sub-47-second time in the 400-meter hurdles. Campers from as far away as New York and Texas attended last week’s festivities, with ages of athletes ranging from middle school to college. Owens said she wanted to emphasize what a great sport track is and how it is a building block for many other sports. All sports require speed, endurance and strength, and track and field can build confidence, Owens said. As part of Maximum Velocity, all campers were invited to the Bluegrass State Track and Field Meet also held at Centre College on Saturday. The Bluegrass Games are broken down by age group, allowing entire families to get out and join the fun. Even events that aren’t usually seen at a local level, including the javelin, steeple chase and Hammer, were included in the meet. McDaniel highlighted the games’ action for local athletes as he won his age group in the high jump with a height of 6 feed, 6 inches. Photography Services in Dubai I really enjoy the blog.Really looking forward to read more. Keep writing.